Essentially a tale of transition, the story unfolds from the perspective of Huw Morgan (Roddy McDowall), who grew up in the village during happier years when the surrounding valley was not yet stained black by the coal mine upon which the town depends. Prosperous at first, the Morgans face various problems as the mine owners become more interested in making profits than taking care of their workers. Huw also has his own crisis when, as the first in his family to receive a formal education, he must face a schoolyard bully and suffer the cruelty of a tyrannical teacher. Academy Awards: Won for Best Picture; Best Director; Best Supporting Actor-Donald Crisp; Best Art Direction-Set Decoration; Best Cinematography. Nominated for Best Supporting Actress-Sara Allgood; Best Screenplay; Best Sound; Best Score-Alfred Newman, 1942. DVD: Standard 1.33:1; audio English Digital Mono, French Digital Mono; subtitles English, Spanish; closed-captioned; single sided - single layered; no chapters; rated NR; 118 min. ; $24.98; street date 3/7/2000. Supplements: Photo Gallery; Theatrical Trailers. 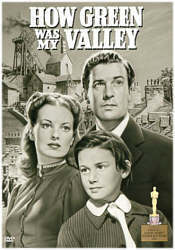 Despite a fine pedigree, 1941's How Green Was My Valley remains remembered mainly not for its legendary director (John Ford) or solid cast (including Walter Pidgeon and Maureen O'Hara). No, folks remember HGWMV mainly because it presented what many feel is one of the great Oscar injustices: it took Best Picture over Citizen Kane, the film that tops many best-movie-ever lists. Despite all my ranting against the Academy over the years, I won't decry this as a horrible injustice, mainly because I've never been that big a fan of Kane. However, now that I've seen HGWMV, I better understand the furor; while not a bad film, HGWMV certainly is a dull, predictable piece of work that does nothing to differentiate itself from about a million other films about the troubles of working class families. Director Ford earned a lot of goodwill from me with his terrific Western Stagecoach, but a lot of that evaporated as I watched HGWMV. Again, the film is competently made but it's so dull and flat that I had a hard time getting through it. I've seen so many of these "poor but proud family" dramas that they all come across exactly the same way; there's so little to make them stand out that I become quickly bored with them. That's what happened with HGWMV, though I don't know if it's something I can really fault the movie itself for being. After all, clichés in 2000 may not have been clichés in 1941, so I have no objective way of knowing how original or unoriginal the film was during its first release. All I do know is that I didn't care for it. Despite the lack of a compelling or creative story, the film could have succeeded better if the characters were more interesting. Unfortunately, they seem quite flat as well. The Morgan family of Wales packs in a lot of males, with a father and five sons; one daughter and a mother round out the package. Other than Huw (a very young Roddy McDowall), there's almost nothing to differentiate between the brothers; they all seem like the same person. The daughter, Angharad (O'Hara), stands out just because she's the only younger female; other than that, she's pretty dull too - her only distinguishing characteristic is that she has the hots for the new preacher, Mr. Gruffyd (Pidgeon). That turnabout is the only surprise in the film; the rest of the picture plods along predictably as we witness the usual working class melodrama. After the highs of Stagecoach, I hoped for another entertaining experience with HGWMV, but that wasn't to be. How Green Was My Valley appears in its original theatrical aspect ratio of 1.37:1 on this single-sided, single-layered DVD; due to its dimensions, the image has not been enhanced for 16X9 televisions. Though not without flaws, the film looks surprisingly good for such an old movie. Sharpness appears consistently quite strong, with a crisp and well-defined image for the most part. Some slight softness intrudes upon some interior scenes, but these are the exceptions. I noticed no signs of moiré effects or jagged edges. The print used displays occasional flaws, mainly in the form of black speckles, but these are surprisingly rare; overall, the film seems remarkably clean and free of defects. I noticed no signs of grain whatsoever. Black levels are appropriately deep and dark, and shadow detail looks ever-so-slightly heavy at times but generally appears clear and adequately shaded. Overall, HGWMV provides a terrific viewing experience. Less satisfactory but still acceptable is the film's monaural audio. I found it to be perfectly average for a film of this vintage, but compared to the very good picture, the audio flaws stand out more strongly. Dialogue always seems clear and intelligible and actual displays a much more natural quality than I expect of a film from this era. The music and effects, however, come across more harshly and sound fairly thin and tinny in comparison. Some distortion shows during slightly loud scenes (such as the many choral performances). For its time, the track is perfectly adequate; it just doesn't match up with the high standards set by the picture. HGWMV includes a few pretty bland supplements. A picture gallery presents 10 stills; these are a mix of publicity shots and pictures from the set itself, plus one of the film's poster. Also, we get a number of different trailers. In addition to that odd "devil tyrant" piece for HGWMV (actually a trailer for the film's post-Oscar reissue), we find clips for An Affair to Remember, Love Is A Many Splendored Thing, Gentlemen's Agreement and All About Eve. Despite very good picture quality and adequate sound, I can't really recommend How Green Was My Valley just because I found the film itself to be a predictable bore. It's well-crafted and produced, but the story and the characters are dull and flat. It might be worth a rental for those who want to see the movie that topped Citizen Kane for Best Picture in 1941, but that's about the most I can say for it.